Will I as an Individual or my family be eligible for tax credits in 2018? Depending on your income, your age, the size of your household and where you live many Americans might qualify for subsidies in the form of tax credit or direct governmental payments towards the health insurance to pay for insurance premiums. Not only low-income families but also moderate-income families up to 400 percent of the Federal Poverty Level will receive subsidies. (For a family of four that is $98,400) The subsidy is based on the Modified Adjusted Gross Income based on your 1040 tax return of the previous tax year (Line item 37 of your 1040 form; line 21 of your 1040A; or line 4 of your 1040EZ) , and will be adjusted yearly accordingly to your tax return. Below is the 2018 Federal Poverty Guideline. 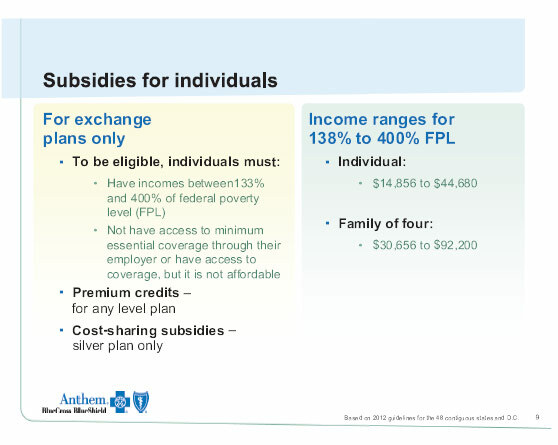 If you earn under 400% of the FPL, you will most likely be eligible for a subsidy, which helps you pay part of your health insurance premium. The Kaiser Family Foundation has created the Health Reform Subsidy Calculator, which easily shows if you will qualify for subsidies. Please use this important tool from the Kaiser Family Foundation to estimate your cost. The subsidies are not available for employees who receive insurance through their employees. Only for groups of 50 employees and more, one can go to the exchange in the case that the employer insurance package is higher than 9.5% of an annual employee income.